For New U.S. Mideast Peace Envoy, It Will Be A Long Road To 'Ultimate Deal' : Parallels For years, Jason Greenblatt was chief legal officer at the Trump Organization. Now his job is to help bring peace to the Middle East. His closeness to Trump may help, but it's no guarantee of success. Israel's Prime Minister Benjamin Netanyahu meets President Trump's Middle East envoy Jason Greenblatt in Jerusalem on June 21. Jason Greenblatt was the chief legal officer at the Trump Organization. Now President Trump has tapped him to help end the longstanding Israeli-Palestinian conflict. It's a job that has become even harder in the past several days, with a new eruption of violence: Palestinian Arab citizens of Israel fatally shooting Israeli police at an important holy site; three Palestinians killed in clashes with Israeli forces; three Israelis stabbed to death in their home by a young Palestinian. There have been many U.S. peace envoys before him. But Greenblatt is doing things differently. For one, he's engaging in Twitter diplomacy — offering a personal peek at the Israelis and Palestinians he's been meeting. Earlier this month, on his fifth trip to the region in his official role, he tweeted about his meetings with Christian religious leaders in Jerusalem. On a visit in mid-March, he tweeted about visiting Israeli university students and Palestinians in a West Bank refugee camp. On the same trip, he went to a Jewish religious seminary — a yeshiva in the Old City of Jerusalem — and then tweeted a photo from the home of a "new Palestinian friend" he said was five minutes away. Greenblatt is an Orthodox Jew who has also posted photos of himself praying for peace at Jerusalem's Western Wall, a religious site revered by Jews. Here's another thing that makes him different from other U.S. envoys: He once studied in a yeshiva in a West Bank settlement. "You see that red rooftop just behind that building?" said Oded Revivi, the mayor of the Efrat settlement and a leader in the Jewish settlement community. He was pointing out the window of his West Bank office in the direction of the Har Etzion Yeshiva where Greenblatt studied as a young man. 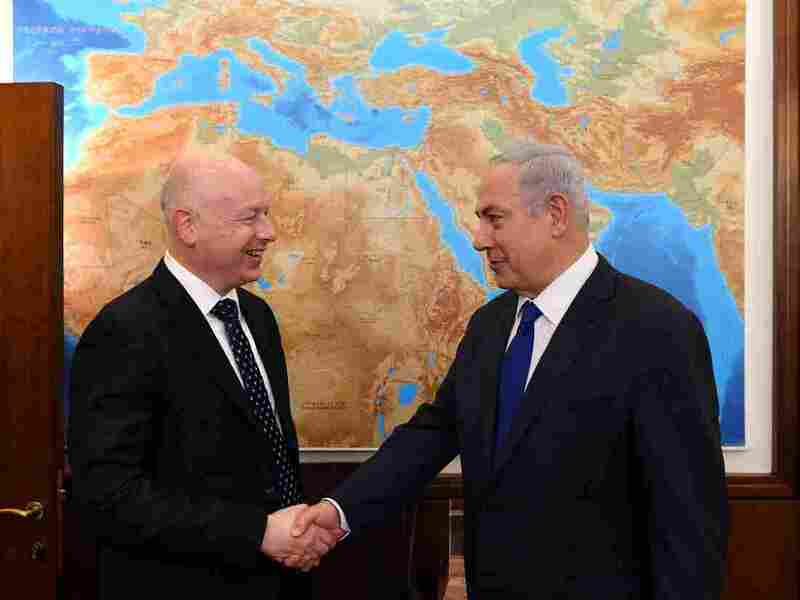 Revivi met Greenblatt a few months ago, in what Revivi said was the first meeting between a senior U.S. administration official and senior settler leadership. The Trump administration has taken a friendlier approach than its predecessors to West Bank settlements in the Israeli-occupied West Bank. The U.S. has long called settlements illegitimate, and while the Trump administration has said settlement activity is unhelpful to advancing peace, it has sought to reach an agreement with Israel about what kind of settlement construction the U.S. would tolerate. Revivi feels like Greenblatt has been in his shoes. "He used to shop in the supermarket [where] there are Jews and Arabs shopping in the same supermarket. So he understands the proximity and the complexity," Revivi said. In Jordan, economist Riad al-Khouri is also heartened by Trump's appointment of Greenblatt and his selection of son-in-law Jared Kushner to lead peace efforts — but for different reasons. "The use of your own personal lawyer and your son-in-law — that's typical of Arab culture," said Khouri. "These guys are very well-placed to knock Israel over the head with a dose of reality." Whether that will happen remains unclear. Israelis who have met Greenblatt say he has chiefly been interested in listening so far — studying their positions on the chances for peace. A group of Palestinian entrepreneurs who met Greenblatt had the same impression. "The Palestinians were talking. He was most of the time listening to what was being said," said Shadi Atshan of Leaders, a nonprofit that solicits funding and provides support for Palestinian entrepreneurs in the West Bank city of Ramallah. Atshan said Greenblatt seemed particularly interested when the Palestinian entrepreneurs told him Palestinians don't have 3G high-speed roaming Internet and use Wi-Fi and older 2G technology instead. After their meeting, Israel announced it would allow 3G service in the West Bank soon. But so far it's just a promise, said Atshan. "We're not really optimistic that the Trump administration will change our life positively," said Atshan. NPR has not yet been granted an interview with Greenblatt. The Trump administration has stressed that peace will take time. But the Palestinian leadership wants the U.S. to move quickly. Ahmad Majdalani, a confidant of Palestinian Authority President Mahmoud Abbas, said Greenblatt has not yet put forth a framework for what a peace deal would look like — not even a commitment to creating a Palestinian state alongside Israel, something U.S. policy has espoused for decades. "Until now, we didn't hear from Greenblatt any[thing] new about the vision of U.S.," Majdalani told NPR. Neither side appears eager to start another peace process. 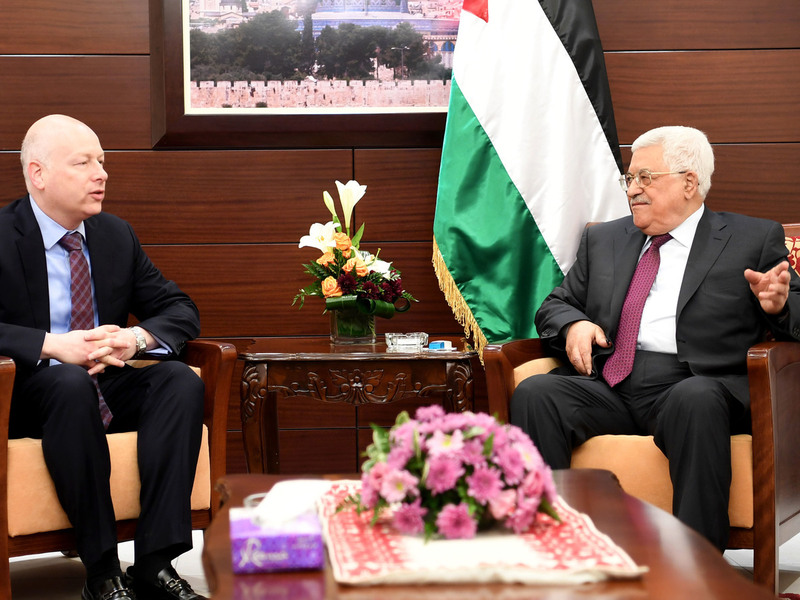 Greenblatt met with Palestinian leader Mahmud Abbas in the West Bank city of Ramallah on May 25. "We believe strongly that there is no Israeli partner for peacemaking," Majdalani said, referring to Israeli Prime Minister Benjamin Netanyahu and his government. "This is not a government of peace." Meanwhile, Israeli Intelligence Minister Yisrael Katz, who also met with Greenblatt, told NPR the unrest in the Mideast makes it too difficult for Israel to relinquish the West Bank, and that Palestinian Authority President Mahmoud Abbas is unable to deliver on a peace deal since losing control of the Palestinian territory of Gaza to the Islamist group Hamas in 2007. David Makovsky, a member of the Obama administration's Middle East peace negotiations team, warned about what he called the familiar blame game. "I am just worried about some of the public statements I'm seeing makes me think that, you know, people are positioning themselves for failure more than striving for success," Makovsky said. He said the "good news" is that the Trump administration appears to still have some leverage. "Neither Palestinians nor the Israelis want to be seen as saying no to Trump," he said. "My fear is that the way to square the circle for the parties to not say no to Trump — and yet not expend political capital — is to say, 'The other side is saying no to Trump.' "
In other words, Makovsky said, "They want to blame each other without blaming Washington." With Netanyahu and Abbas so distrustful of each other, he said, an "ultimate deal," as Trump has put it, is unlikely. Instead, it might be possible to take small steps toward peace — like Israel freezing settlement construction deep inside the West Bank, where a Palestinian state would be built, or the Palestinian Authority cutting financial benefits to Palestinian prisoners held by Israel for committing attacks against Israelis. "It might not be as glamorous as a grand deal," Makovsky said. "But I do think you can move the ball."